Come join me as I’m doing my research of the best backlink analysis tool that will give you access to vast amounts of data as well as provide you with an advanced set of functionalities. 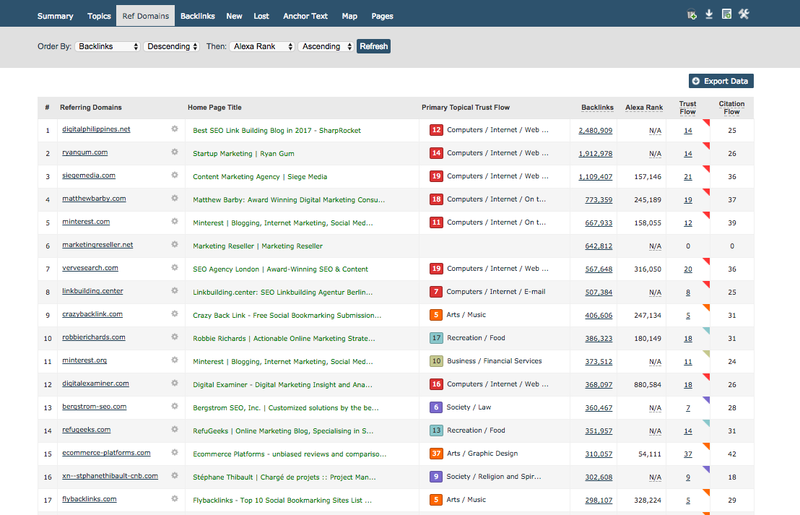 If I were to analyze all of the existing tools for backlink analysis, it would’ve taken me weeks, if not months. 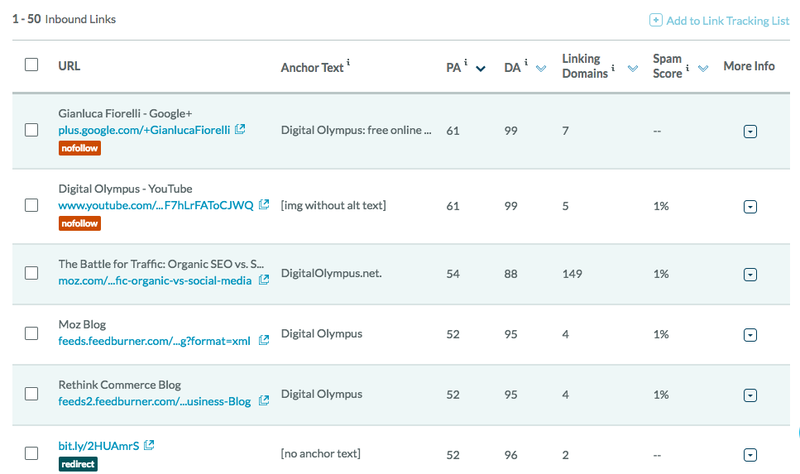 To keep things a little more simple and concise, I’ve selected four backlink checkers based on recommendations of industry experts and my personal preferences: Ahrefs, Majestic, SEMrush, and Moz. In case you don’t have time to review my post, the table below summarizes my findings regarding all four tools included in my research. By clicking on a particular feature within this table, you’ll be forwarded to the chosen chapter that will share more details. 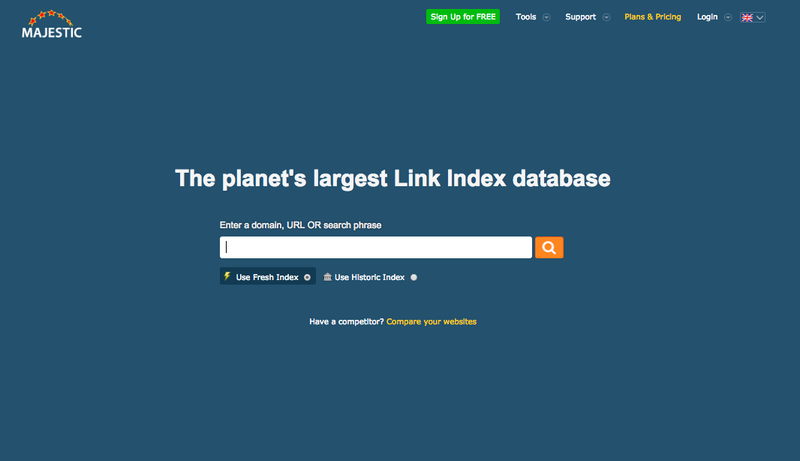 1Is The Size of The Backlink Database the Core Metric? 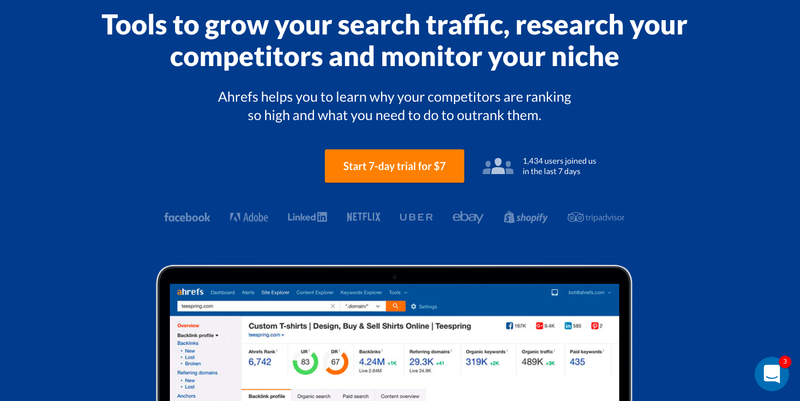 The first tool on my list, Ahrefs, is a toolset for backlink and SEO analysis, well-known for its large base of live links, hefty Index and good speed of Index updates. The toolset consist of Site Explorer, Content Explorer, Keywords Explorer, Rank Tracker and Site Audit. Majestic is another SEO intelligence tool that, in the company’s words, «surveys and maps the Internet and has created the largest commercial Link Intelligence database in the world.» Majestic is focused solely on links because this is their primary type of report. SEMrush positions itself as an all-in-one digital marketing suite with tools for SEO, PPC, keywords research, social media, PR and content marketing. SEMrush has a myriad of tools and reports, but its most powerful features focus on competitors' research. Moz offers similar inbound marketing and marketing analytics software that provides various insights into search engine optimization. The company has recently added back their keyword analytics that was removed from the toolset a few years back. Now, how does this article stand out from hundreds of others that dissect different digital marketing tools, you ask? Having an extensive professional hands-on experience in the digital marketing industry, including the four years I worked for SEMrush, my daily grind now includes being an independent digital marketing consultant while working closely with digital marketing tools. 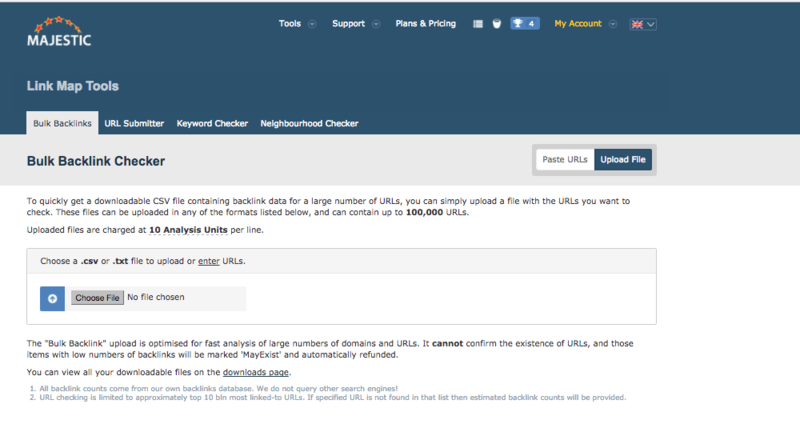 Chapter 1Is The Backlink Database Size the Core metric? A metric like the size of a backlink database seems to be very straightforward and easy to follow, and that’s the reason why a lot of marketers prefer to rely entirely on it when they are searching for a new tool. No doubt, we all have a good excuse —lack of time—so I don’t think there’s a marketer out there who can spend a few weeks testing various digital marketing tools. Personally, I don’t agree that the size of a backlink database is the only metric that indicates whether a tool is the right solution for you. It is certainly among the top ones. But who needs a tool that shows you only some fragmented data without helping you see the full picture? Perform a random check, which can include five to 10 sites. However, in our case, I analyzed a randomly compiled list of 1K domains and data extracted from these four tools. 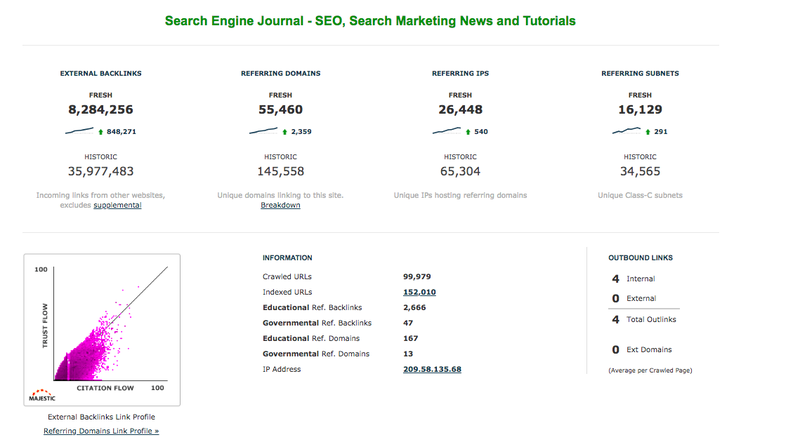 On the main page of SEMrush’s website you can find some numbers, but they only illustrate how great their keyword and competitors' research reports are. 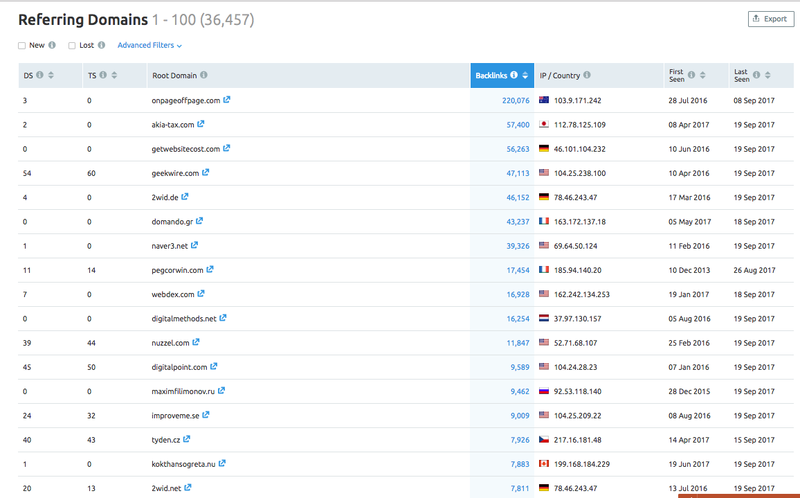 Looks like SEMrush has over 6,2 Trillion backlinks in its database. 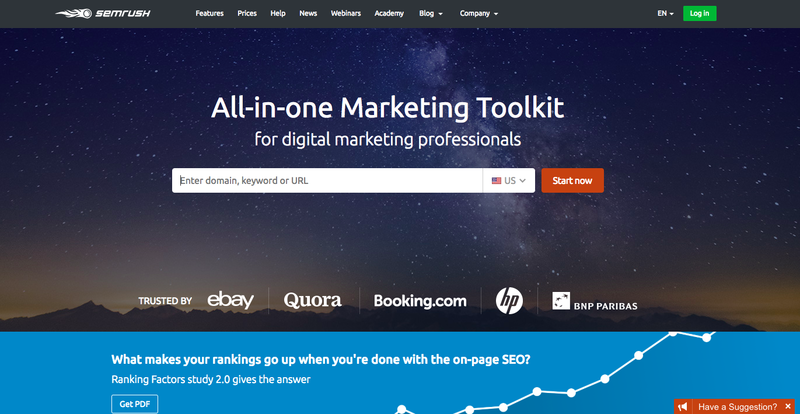 With Moz, Majestic and Ahrefs it took me less than a minute to find what I was looking for. Please note that these numbers are constantly changing, and all backlink analysis tools are trying to grow their database on a daily basis. I am doing my best in keeping up with these changes, but if you feel like there’s something that needs to be updated, please let me know in the comments section or message me on Twitter. Time is a precious commodity. That’s why sometimes we have to blindly rely on the data we receive. But not today. To help you focus on more important tasks, I’ve dedicated many hours to complete an all-encompassing research. And all you need to do is to get comfortable as you’re reviewing the results. Ahrefs, Majestic, SEMrush, and Moz claim that they have trillions of links. Sounds great, but if you’ve ever worked with backlink checker tools, you must have noticed when sometimes one tool shows just a few links and the other one — 10 times more. That’s the reason why by far the most effective way of validating the number of backlinks in a database is by checking several domains (ten, in most cases) and then comparing the numbers you receive. Even though you will be able to get some answers, there’s still some gaps. This is an extremely elementary approach because 10 domains won’t represent the entire database. To be able to make an informed decision and be confident with my conclusion, I analyzed 1,000 most visited domains worldwide from SimilarWeb. 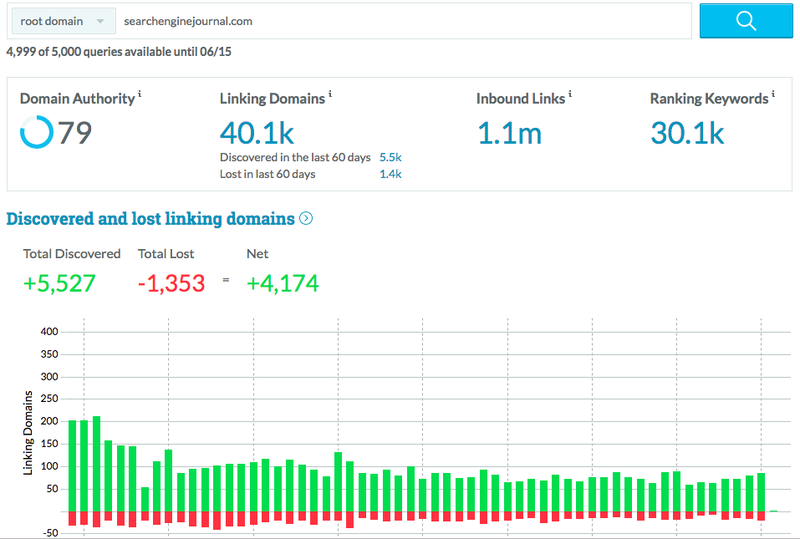 Some tools like Ahrefs and Majestic allow you to analyze hundreds of domains at once (Ahrefs —more than 200 domains, Majestic — 10,000 domains) using an internal ‘Bulk Link Checker' tool. 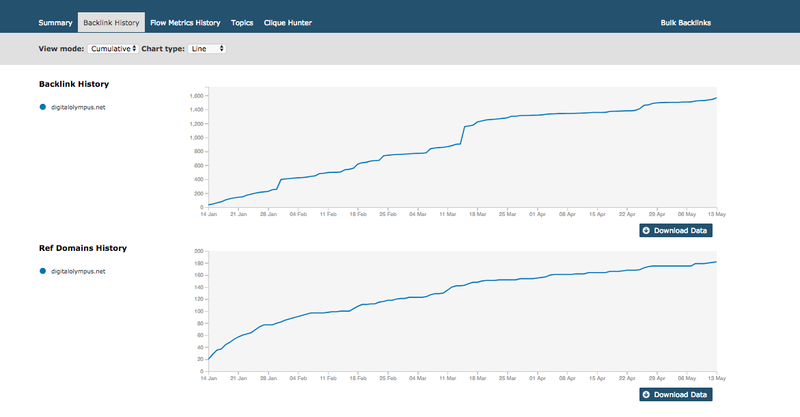 The data I received from Moz and SEMrush has been collected with the help of their API. Majestic’s tool rocks! It’s offers fantastic features that will come in handy for those users like me who don’t know how to code but have a strong desire to work with large amounts of data. If you’re interested in getting a bigger picture, here’s a link to my raw data file. In order to do a more extensive research, you are going to need to have access to the above mentioned tools, hours of free time and a personal developer. I did my research utilizing all the resources I had available at hand. Turns out, what these tools claim almost matches with what my research revealed. 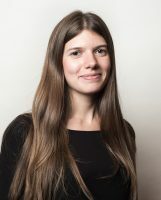 When a company embarks on an adventure of a marketing campaign, quantity, in most cases, is regarded as a good thing. Lots of traffic — good. Thousands of pageviews — excellent! The more the merrier. But the question is whether this abundance of traffic really converts into something meaningful. I know a lot of sites with an astronomical number of visitors that are coming from search queries irrelevant to what products or services a company offers. Realistically, it is a vanity metric that doesn’t really help a company grow. The same logic can be applied to data: quantity in itself cannot drive success and profit. Having trillions of data won’t help you advance. In fact, it’s more likely to blur your vision and make decision-making arduous, increasing cost and reducing efficiency. Data needs to be visualized, organized in the right order, to be easily accessible and readable at-a-glance. To make sense of those heaps of data you need to have the right functionality to work with it. And this is what you’re going to learn below. Typically, if a tool doesn’t provide the set of reports and predefined metrics, you won’t really know what the tool is capable of. Unless you’re a dexterous marketer by day, and a coder by night. Then dealing with raw data shouldn’t be an issue when you’re trying to understand a tool’s SEO plan. But the majority of marketers, including myself, prefers using tools that offer such insights in a few clicks. That’s the real value of backlink analysis tools because they give you exactly what you’re looking for, without the need of filtering data manually. In this section I put together a list of metrics that help marketers determine trustworthiness of referring domains linked to a specific website. In a table below you will find metrics that are crucial when it comes to checking quality of a backlink profile. The table shows if a particular metric is featured in any of the tools I’ve analyzed. I’ll be explaining why I’ve chosen these metrics as key in understanding the nature of any backlink profile below. Information about diversity of referring subnets and IPs specifies if the websites linked to a certain domain are hosted on the same servers. Google checks both of these metrics and penalizes those sites that have too many links coming from the same subnets or IPs. Moz doesn’t provide any information about these metrics. The following two numbers are mandatory. When I evaluate the quality of a site’s backlink profile, I always look at the ratio of domains and backlinks it has. This metric shows if the backlink profile is organic, or, in other words, isn’t comprised of spammy links. For example, a domain has 1,000 referring domains with 100,000 backlinks. These numbers look very suspicious, so you need to stay alert to such red flags. 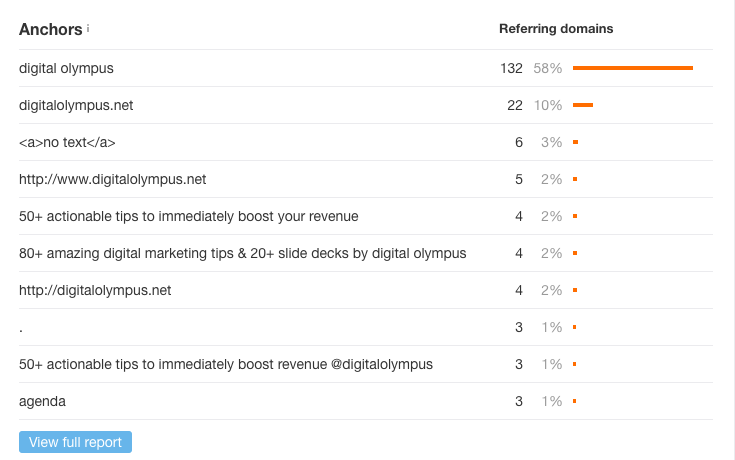 All tools will show the number of referring domains and backlinks on their main site’s overview dashboard. Below are a few screenshots that will give you an idea. 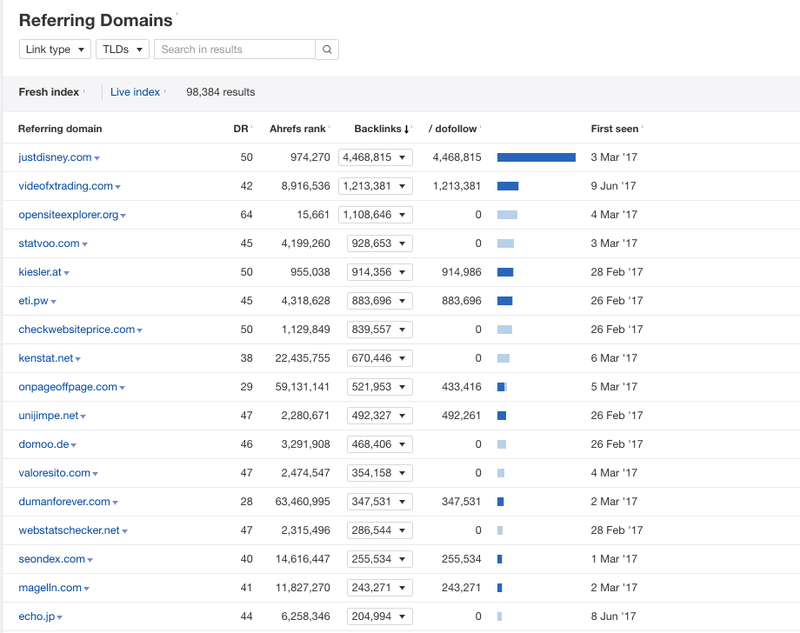 Additionally, if you open a report with all referring domains, Ahrefs will let you filter out domains that have the largest number of backlinks. You can then export them into a file and manually check if any of them are toxic. Finally, there’s another metric I always keep in mind when auditing backlink profile. Backlink history shows how many links to a given domain web crawlers have found in the past. The chart indicates of the backlinks growth associated with a specific domain, and it shouldn’t have any ups and downs. Information about backlink history can be found in all tools, except for Moz. Most tools show CTLDs distribution on a main dashboard visualized as a map. This data is based on country code top-level domain (ccTLD) which is an Internet top-level domain generally used or reserved for a country, a sovereign state, or a dependent territory. Both Majestic and Moz don’t have any data for the internet domain extension. The number of .gov and .edu referring domains also adds up to a domain’s trustworthiness and credibility level. Such sites will never refer to a spammy website in the first place, unless they are hacked, but that’s a different story. 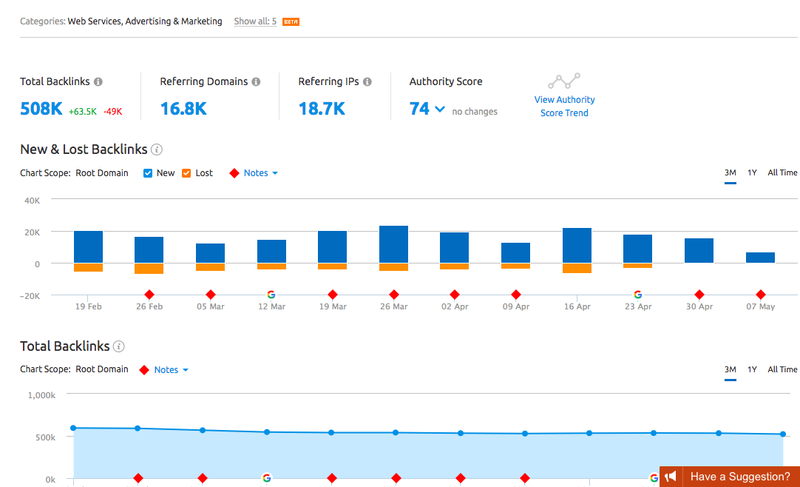 I’m not going to add any screenshots here because Ahrefs, SEMrush, and Majestic all have these domains added to their main site’s overview dashboards, as well as support more detailed reports on that matter. Some people say that there’s not much difference between the link that’s coming from an image and the one that’s inserted within a text. For the most part, I agree with this statement. Although I can still think of cases when you do need to see the domain’s distribution links by their type. 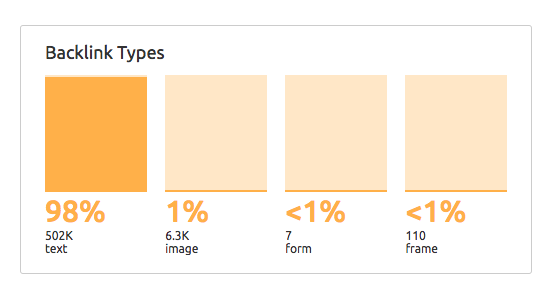 Especially if we are analyzing sites that had been doing link building through images. Ahrefs and Majestic show this metric on their main dashboard. Although you can only see the number of links, not their type. To get this information, you need to check redirects. Both of these tools allow to filter out redirects from the backlink report, but that’s it. Unfortunately, this tool doesn’t tell you anything about redirects, which is definitely a missing piece of a puzzle. In my opinion, anchor text distribution is one of the most important features mentioned in this post. Sometimes, by looking at what kind of anchor texts a domain or a page has, you can easily track down suspicious activities related to acquiring links. 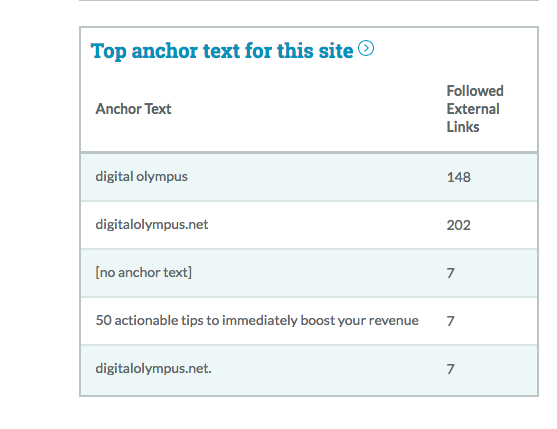 If you’re still not sure what type of anchor profile should be considered spammy, read one of my articles published on the SEMrush blog. It explains this subject in great detail. Some metrics can be listed under a specific category, but there are some that can’t be easily labeled. Yet still, they deserve to be mentioned because somehow they make the lives of digital marketers easier. 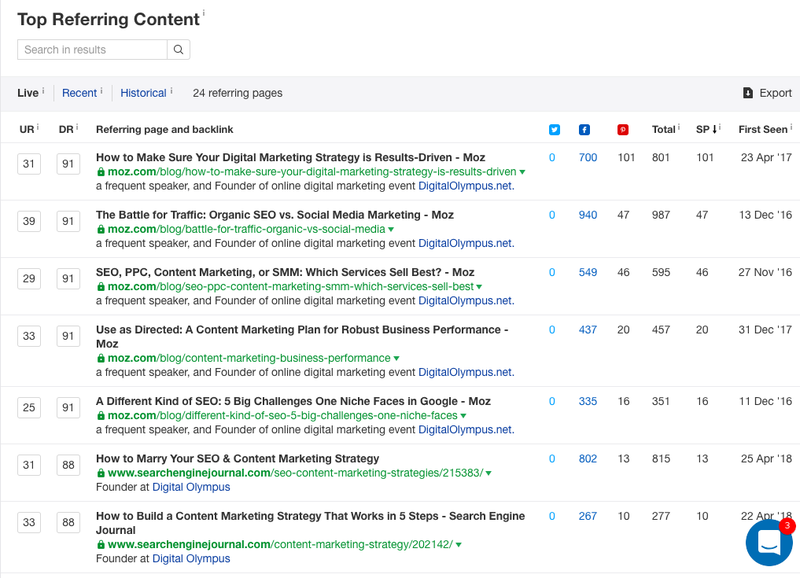 Ahrefs' Top Referring Content is an extremely useful feature that allows to view the top websites that link back to your competitors. This, in turn, gives you the names of the most wanted platforms you need to work with. Using this report will also help you reveal a site’s referring domain profile if the top referring content is irrelevant to the domain’s niche. Moz incorporates a column called ‘Spam Score' into their Link Explorer tool. This metric is applied to every inbound link based on the percentage of sites that have similar features, and that were penalized by Google. Personally, I think this metric is very handy for digital marketers that aren’t very well versed in link-building, but want to keep an eye on the quality of links they currently have. Another feature that I’d like to cover is Majestic’s Topical Trust Flow. The Topical Trust Flow feature identifies which niche does a link belong to, and how precise this prediction is, according to Majestic. Majestic’s team has also categorized the subdomain and the root domain levels. The screenshot above shows the root domain categories for the BBC.co.uk. The site has a lot of authority in the Arts and Television niches, but it’s not that credible when it comes to Auto industry. For example, if you queried the ‘Top Gear' page as a URL on BBC’s website, that page has considerably higher Topical Trust Flow in that sphere. So if you are suspicious of some of the referring domains your site has, then you don’t need to waste your time on checking this information manually. You can get busy with much more joyous activities instead. SEMrush Backlink Audit will assist you in examining the number of so called toxic domains referring to your site. In my case, the screenshot below shows that my score is fortunately low and that I can carry on with my strategy. The screenshot below demonstrates a detailed report that points out which domains have to be removed to improve a site’s overall score. You can also connect your Google Search Console in order to thoroughly analyze your backlink profile. 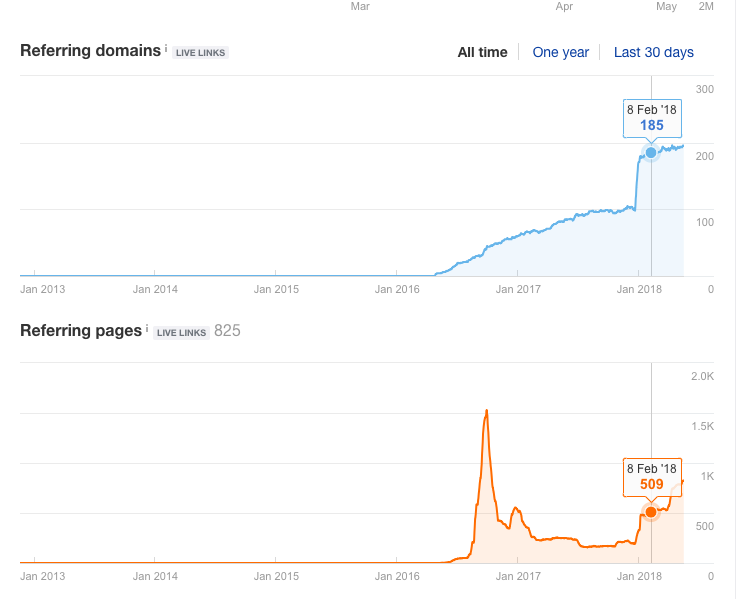 After a thorough comparison, Ahrefs is a winner when it comes to the number of backlinks it has and its overall functionality, but Majestic is breathing down Ahrefs' neck. Both tools offer a wide range of capabilities, and help digital marketers with their daily professional routine. However, SEMrush also has a promising potential, improving its reports and features day by day. Frankly, I find some of SEMrush’s features more appealing than the ones in Majestic or even Ahrefs. Yet, I personally don’t use SEMrush for backlink analysis. Considering that the size of the backlink database is the key factor in this comparison, Ahrefs is winning by a neck. In case you are managing a relatively small project, then Moz will be your best bet. On the other hand, I recommend to try to understand what other reports and features, apart from links, you may be using. Who knows, SEMrush or Ahrefs may work best for you.